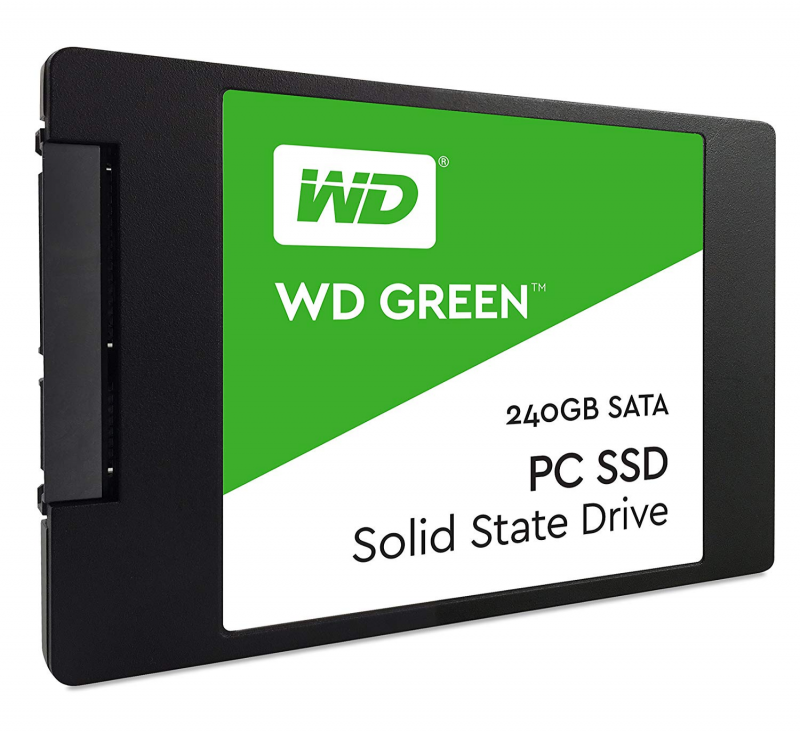 For the operating system drive, iBUYPOWER provided an SSD, the WD Green 240GB SSD. Let’s see how she performs. We can see that the Read here was 492.1MB/s (MegaBytes Per second), while the write was 364.4MB/s. 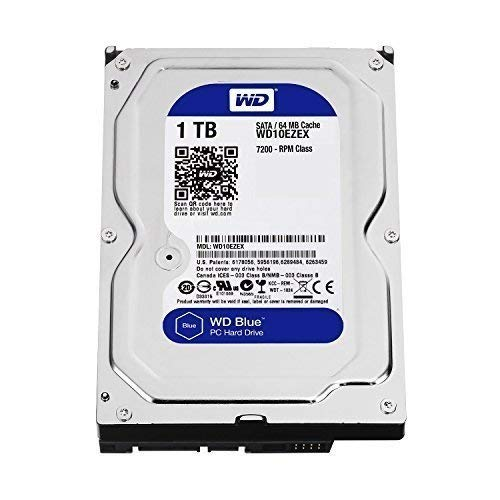 By far, nothing to write home about but now let’s see the speeds the 1TB Blue Drive achieves, a mechanical drive. The numbers may not mean a lot to you yet, but the SSD reached 492 on write versus the mechanical drives 180.8. 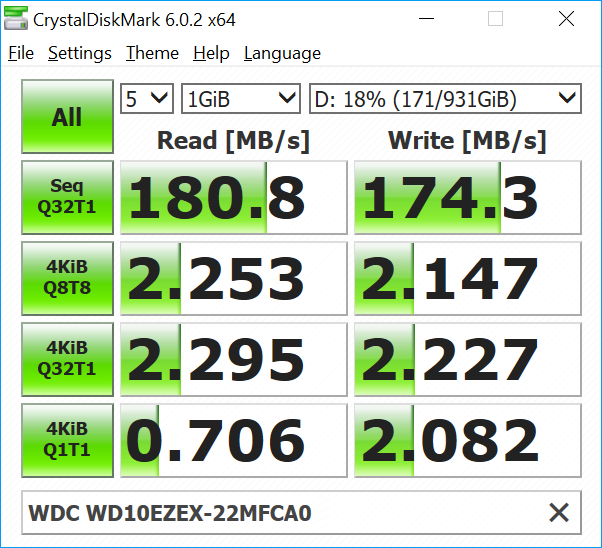 What this means is that the SSD reads data 172.17% faster than the mechanical drives and then with that, the SSD wrote information at 364.4MB/s while the mechanical drive wrote it at 174.3MB/s. So again, the SSD writes it faster, 109.06% faster in fact than the mechanical drive. 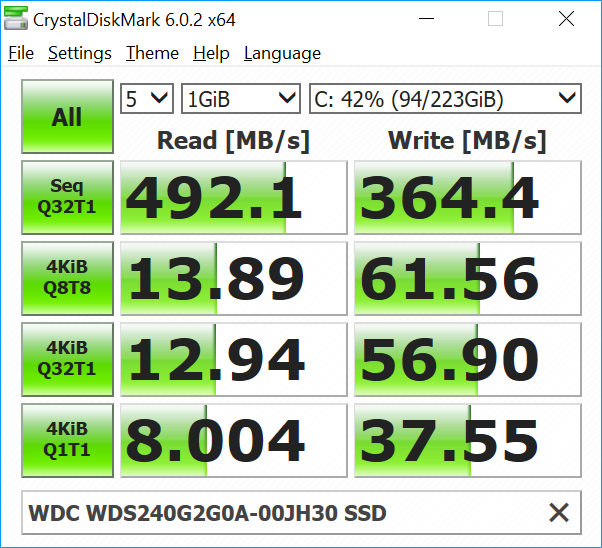 Many of us know that an SSD is much faster than a mechanical drive, but I am writing this for those of us that may not know this, I want to help everyone else out. This also though it to remind you that even though this is not the fastest drive, it is ALWAYS faster than a mechanical drive. Many OEM’s still include mechanical drives in their systems as boot drives, sometimes they are even 5400RPM’s drive which are much slower. 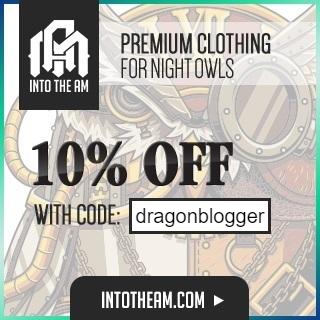 Something I will focus on more a bit later, but relevant to this portion of the review is that MSI on their website for the motherboard, provides a piece of software called Dragon Center. 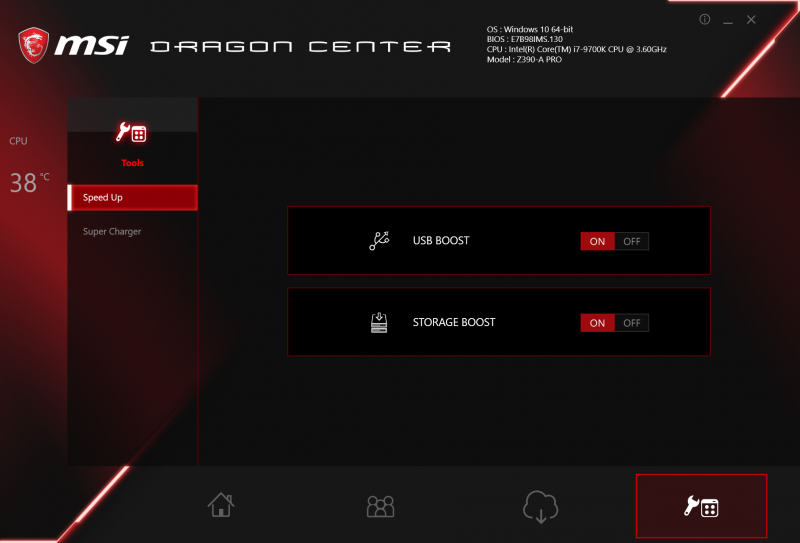 Dragon Center allows you to improve the performance of your drives as well just flicking a switch, so I figured to try it. 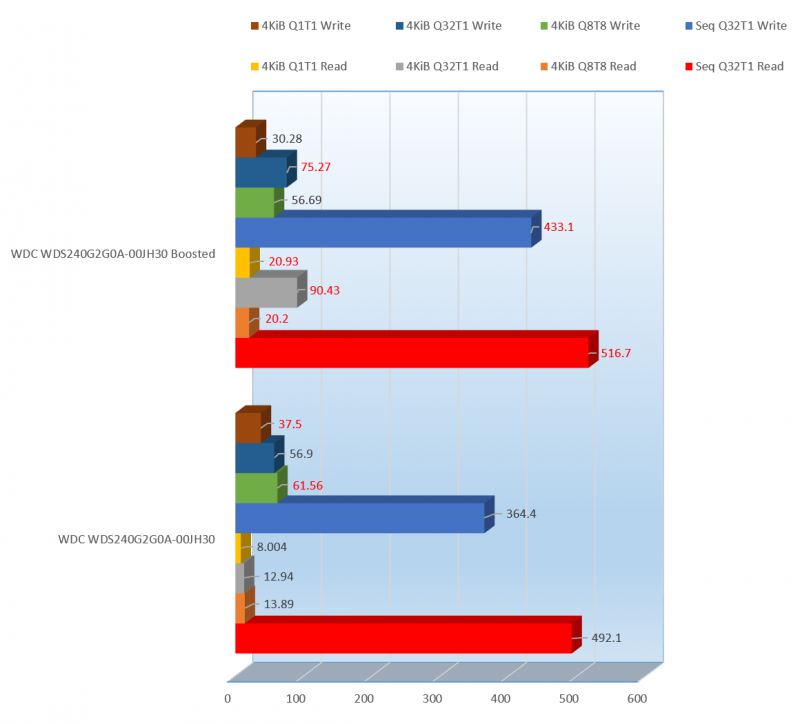 We can see here the boosted drive, boosted using Dragon Center’s switch for the most part performs better than the standard drive. I didn’t want to get into each of these, since this is an overall performance score, but I think I should let you know what each of the sections are listed above in the legend. Windows assumes that files and memory are handled in 4 kilobyte chucks, meaning that all transfers from a drive to memory are 4 kilobytes in size. A queue, is a set of instructions, 1 queue is one set of instructions and multi queue or multiple queues are multiple sets of instructions or data and they are processed in order. A thread, manages the queues processing their data, a thread handles 1 queue, multiple threads handle multiple queues to process data efficiently. The one most pay attention to is the Seq Q32T1, as this is the reading that drive manufactures publish and are usually held accountable for. You can see that the sequential data is read 5% faster on the boosted results than it is on the standard results and is written 18.85% faster in the boosted results over the standard results. That’s pretty impressive considering it’s a free and easy overclock. 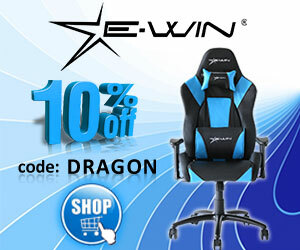 This software is actually pretty good, but is not included in the install from iBUYPOWER as some may consider this bloatware, but actually is a bit handy. I recommend downloading this off of the MSI’s Z390-A Pro with WiFi support site, along with a few other important things I will mention later in this review. It comes on the media included but I always recommend downloading the latest version, regardless since there is no optical drive, you cannot read it and it also saves a few dollars it not being included. I would like to reiterate, the operating system is installed on the SSD, not the mechanical drive so this lends itself to the system running so smoothly. 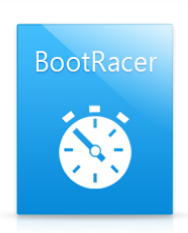 When you have a powerful system, you want things to run well, you also want the system to boot quickly, so I will test the boot speeds using BootRacer from Greatis Software. From here, we can see that rebooting a machine took in total 25.093 seconds to boot. Now this does not mean it takes 25 seconds from the second you see the black screen till the point you enter windows. The boot test starts once the BIOS P.O.S.T. screen appears till the point it enters windows, that was 10 seconds. The other 15 seconds is the point that windows finishes loading all of the programs and everything is loaded into the system tray, that is how it gets to 25.093 seconds. 10 seconds into windows at 15 seconds more for everything to load. This means that after 10 seconds you can start using the PC and things will work just fine, but things will run a little more smoothly if you waited those additional 10 seconds. 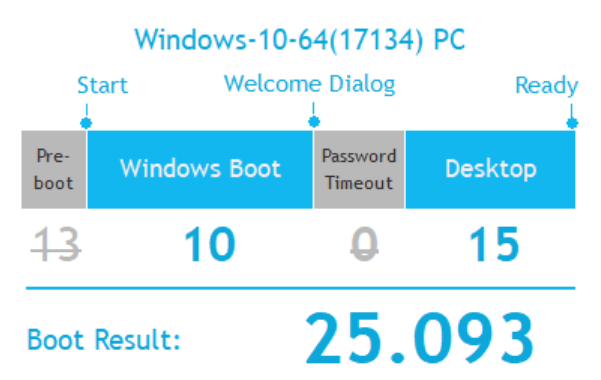 Since the operating system was only on the SSD I could only test on the SSD, but if it were on the mechanical drive booting into windows will take anywhere between 30 seconds to 1 minute longer. Booting into an idle state in windows, throw in another at least 30 seconds. SSD’s are amazing. So let’s move on to the CPU performance with CPU Benchmarks.